This beer was brewed for the holiday season, which stands as evidence of my lack of blogging activity lately. . . blame the baby! (Just kidding, don't blame her for anything.) 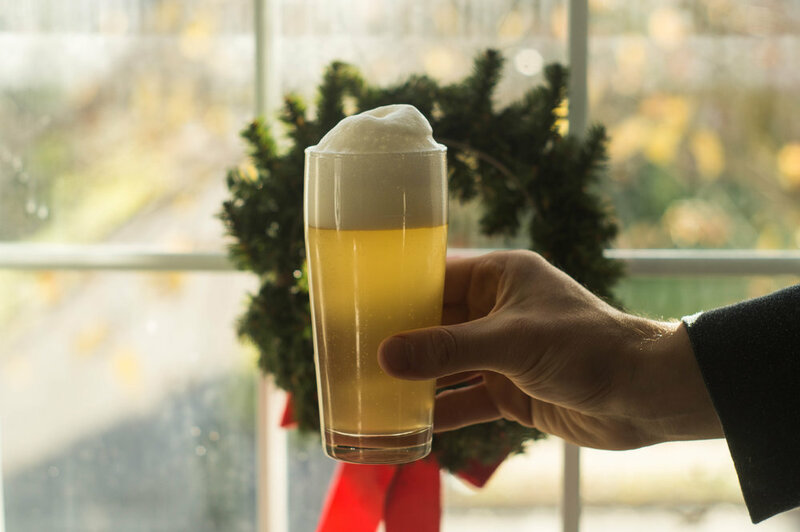 Instead of your usual sweet, spiced Christmas Ale (see: Great Lakes' version), I wanted to keep playing around with saison—the chameleon of classic beer styles. So, I brewed up my standard saison recipe and poured in a bottle of tart cherry juice once active fermentation had slowed down. The yeast made quick work of the sugars, leaving behind a nice, tart pairing for family gatherings & holiday treats. Whether it was the flavor, the rich color, or merely the intention behind it, this Tart Cherry Saison made for a wonderfully festive Christmas companion! Appearance: Crystal clear! Deep orange color; addition of tart cherry juice resulted in darker color than previous saisons. Taste: Tart, some clove (see: Paulaner comparison), finishing dry-but-not-too-dry. Mouthfeel: Full, round body with lively carbonation. Overall: Reminiscent of Paulaner Hefeweizen, but with that snappy saison finish.